I had always used anti aging products that you can put on so this was a new concept to me. I been using this product for a while now and I actually have seen some difference. while it is winter season my face and body tends to dry up more that I have to use serums, face and body moisturizers. This product suppose to work to rejuvenate and moisturize the skin and I am loving that because it is working.It suppose to promote skin hydration from within, helps to reduce lines and wrinkles, aids in strengthening collagen and assists to repair skin damage. I love that this product works from within to the outsideto promote healthy skin. This product contains Vitamin 5000mg of A, 60mg of vitamin C, 400 IU of vitamin D, and 30 IU of vitamin E and 350mg of Phytoceramides. 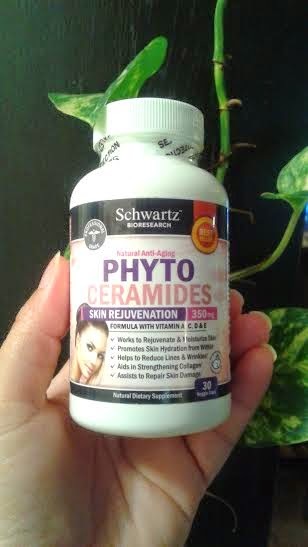 *What is Phytoceramides or “Ceramosides” this is what I found out,they are a super-strong antioxidant that drastically retards the rate at which free radicals damage your skin. They also boost your collagen and elastin production by triggering powerful peptide blends. You take 1 capsule a day as a dietary supplement!